Nothing but the frozen wastes and a giant robot to keep you company. A few weeks ago, I ventured into a portal that transported forward in time and to Seattle. There, I played a bunch of upcoming games and have returned to the present with impressions! 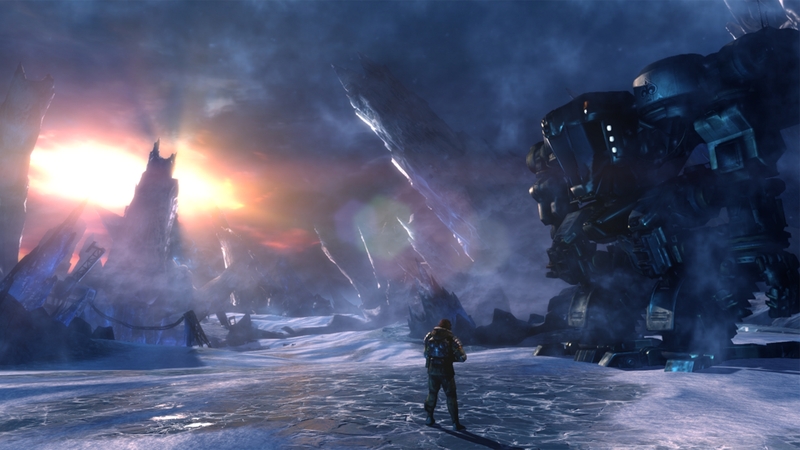 Today: Lost Planet 3. Installation 04 lives again! Originally, I was hoping maybe I could get the old team back together. Now I realize that's not going to happen so I am moving forward as a one-man operation. From now on, Installation 04 is the one and only blog of me, Fuzunga. It'll have a mix of great stuff written by me ranging from analyses of video games, to top ten lists, to original fiction. I've decided to stop waiting and start up the machine once again. So prepare for the best era of I04 yet! As you can see, there's been some reorganization. The menu at the top of the site will filter posts into pretty much every basic category, while the informational page navigation has been moved to the sidebar. At the moment, the Blogger page gadget seems to be borked. I have worked around this. The menu up top functions just fine, but doesn't look as nice and fancy (meaning it won't highlight what page you're on). I'll change this as soon as the problem is resolved to get it looking spiffy! Anyway, I hope the new layout is of use and keep a lookout for regular new content!